these cookies are so good it's stupid. they are like crack. seriously...i think i ate them for breakfast several days after convincing myself they were good for me. i determined that anything with peanut butter and oatmeal in the ingredients list must be healthy. i was justifying my addiction. 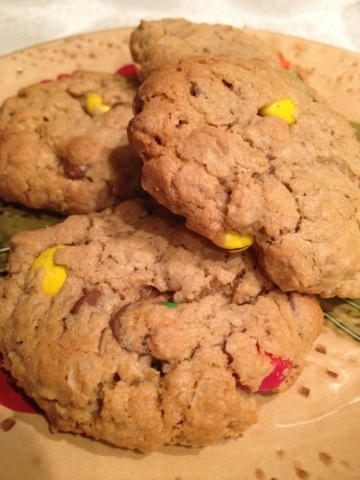 if you have a new year's resolution to lose weight, don't make these. seriously, they are that good. you won't be able to stop. preheat oven to 350 degrees. mix eggs, sugars, vanilla, corn syrup, baking soda and salt. add the peanut butter and melted butter. mix well. 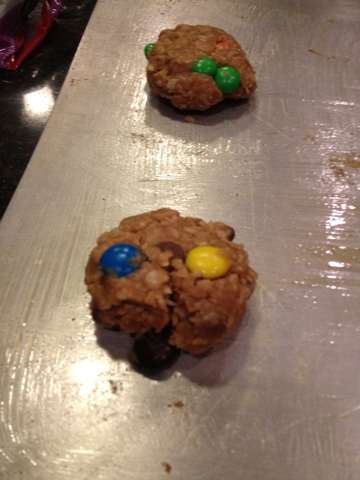 add the flour, oats, chocolate chips, peanut chips and m & m's. spray baking sheets with non-stick spray. scoop out dough by heaping tablespoon. form into a ball and press down lightly onto the baking sheet. bake for 10-12 minutes. let the crack addiction begin.